Planning a fun trip takes effort, but you’ll have even more things to consider if you’re a caregiver traveling with an elderly person. Whether there are mobility issues, health problems or other concerns, you will want to do all you can to ensure that everyone you’re traveling with, including an elderly loved one, has a rewarding, enjoyable experience. This is our list of the five things to consider while traveling with the elderly. Before loading everyone and everything into the family car, a plane or a bus, you need to take your elderly loved one for a check-up to ensure that he or she is okay for a trip. Ensure that you have enough medication, if applicable, so that you don’t run out mid-trip. You also want to ensure there are no issues for your patient with the climate of your destination. 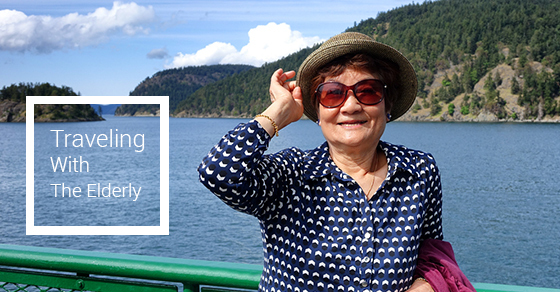 If you’re able, maintain a consistent schedule during any trip with an elderly person. This entails trying to keep things like the time for going to bed and the time for taking medication as consistent as possible. As well, if driving, you may find it beneficial to plan regular stops along the route, perhaps every couple of hours, whether for a meal or to use a restroom. This will ensure that the people you’re responsible aren’t overexerted or overwhelmed. In the event that there’s a medical emergency while you’re traveling with an elderly loved one, you will want to know what medical centers are in the vicinity of where you’ll be staying. In addition to this, it would make sense to explore buying medical insurance so that you’re not hit with any unsightly bill if unexpected emergencies occur during your trip. If your trip will involve staying at hotels, you need to ensure that these facilities will be suitably accessible. If your elderly loved one has difficulty standing or climbing stairs, then you might have to ask for a first floor room. You should, in such cases, also consider bringing a wheelchair to make things a little easier for the elderly person under your care. You’ll need to consider how much your elderly loved one can realistically do while traveling. This means that you’ll probably end up doing a little bit less than you otherwise would have – if you try to fit too much in, you might compel your elderly loved one to do more than they’re physically capable of. Although you may encounter challenges when traveling with an elderly person, proper planning will make for a trip to remember fondly!